OBSERVER-MOBITEL: The three-cornered tussle for the most Popular Schoolboy Cricketer of The year 2011 All Island and Outstation competitions are gearing up for a grand finale on May 15. Coupons should be handed over or posted on or before May 19 (Thursday) before 1.00 pm. Please note that there will not be a readers prize (Cash or T-shirts) in the competition from this stage onwards. Voting for the Observer-Mobitel Most popular Schoolboy Cricketer of the Year will close on May 19 by 12 noon. The last set of voting coupons will be published in the Sunday Observer on May 15 and in the Daily News, Dinamina and Thinakaran until May 18. With little over a week to go for the conclusion of voting for the popular contest, Royal captain Ramith Rambukwella extended his lead and became the first to poll over than 200,000 votes in the 33-year-old history of the Schoolboy Cricketer of the Year contest. He strengthened his lead with a staggering 204,102 votes. In second place is Ananda spinner Sachithra Perera (192,217), followed by former Royal skipper Bhanuka Rajapakse (176,476). K. Gamage of Vidyartha (84,605) regained the lead in the Outstation contest. However, he enjoys only a slim 23-vote lead over second-placed Dushan Vimukthi of Panadura Royal. The coupons continued to pour in favour of Royal skipper Ramith Rambukwella, Anandian Sachitra Perera and the other Royalist Bhanuka Rajapakse who have been dominating the competition from coupon number one. Royal College captain Ramith Rambukwella has topped the 200,000 vote mark and Anandian Sachitra Perera is placed second with 192,217 votes, 11,885 votes behind Rambukwella. Winner of the third place Bhanuka Rajapakse has polled in 176,476, but thereafter the margin of majority between the last seven contestants is becoming bigger and bigger and looks hard to catch up. In the Outstation category, there is going to be a photo finish between the first two contestants Keeshan Gamage of Vidyartha College, Kandy and Dushan Vimukthi of Royal College, Panadura. Believe it ! the deficit between Gamage and Vimukthi is just 23 votes and the ultimate winner of the Outstation category will be anyone’s guess when the competition ends. For the last 33 years the Sunday Observer has provided the backbone for young aspiring cricketers from all corners of the country. The recipients get a terrific boost prior to their entry into the big league journey in the cricketing world. The majority of the winners have represented the country at the highest level at cricket and a couple of recipients have gone beyond the boundary, holding high profile posts at the International Cricket Council. The first Schoolboy Cricketer Ranjan Madugalle has been bestowed with the honour of being the ICC Chief Match Referee for some time, ahead of twice World Cup winning captain West Indian Clive Lloyd and other reputed cricketers. The former Royal College and Sri Lanka cricket captain Ranjan Madugalle, a gentleman to the most literal sense, won this prestigious award twice (1978/1979). Former Sri Lanka opener Roshan Mahanama who was a contemporary of Madugalle, is also a ICC Match Referee and became the Observer Schoolboy Cricketer twice in 1983 and 1984. The latest addition to the distinguished ICC match official list is former Sri Lanka all-rounder Kumara Dharmasena (Schoolboy Cricketer 1989) who has successfully stood as an umpire at all levels of International cricket matches and has won the confidence of the players in quick time. The confidence will no doubt help Dharmasena to pursue his career far. They say that there are no short cuts to succeed in umpiring, but Dharmasena has proved that conception is not one hundred percent true. There is an unprecedented keenness shown by the schoolboys and all others concerned that the running of Inter-school matches should get due recognition. The Observer Mobitel Schoolboy Cricketer of the year show should be a morale booster for the future of the schoolboy cricketers. SLT/Mobitel will be the third sponsor in the history of the Observer Schoolboy Cricketer Contest series after Warner-Hudnut and Bata got the show moving. Ranjan Madugalle became the first Schoolboy Cricketer in 1978/1979 when Warner-Hudnut sponsored the inaugural event. The contest will have the usual backing of the Sri Lanka Schools Cricket Association and the Association of Cricket Umpires in Sri Lanka. The Most Popular Schoolboy Cricketer category will be selected from the voting process while the Schoolboy Cricketer of The Year will be selected by a panel of umpires who have officiated in school matches and selecting players according to their performances during the season. Dinesh Chandimal who has been included in the Sri Lanka Test squad on the England tour party, was the Observer/Mobitel Schoolboy Cricketer 2009. Chandimal a player with immense potential, who was tipped to be in the recently concluded World Cup squad but discarded, finally has found a place in the Test squad. 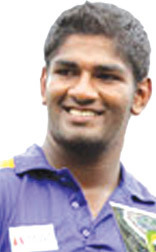 He is the seventh player from Ananda to win the Schoolboy Cricketer plum, besides Arjuna Ranatunga (1980/81), Sanjeeva Ranatunga (1988), Marvan Atapattu (1990), Thilan Samaraweera (1994/95), Muthumudalige Pushpakumara ( 1999) and Malith Gunatileka (2007). Chandimal has made steady progress to the top. He made his maiden cricket tour with the under 15 team to Malaysia in 2006 and did not look back thereafter. In the following year, he toured India with the schools team for a triangular tournament and the next year toured Bangladesh for a youth Test series with Bangladesh. Chandimal proved that he is a player for the future by striking a fine century in a three day game against New Zealand in 2009 for the Board XI.